Once you’re over the hill, you begin to pick up speed. – Charles M. SchulzI’ve mentioned before that just when I seem to be making headway in terms of achieving some semblance of physical fitness, or even a modicum thereof, my body seems to rebel. I’ve referred in the past to this as an ‘intrasomatic conspiracy‘. Well, it seems that having gotten off on the right foot by going to the gym and losing about 10 pounds, insurrection is afoot; my hip is definitely not hopping.It started the other morning. I woke up, went into the kitchen, made some coffee, and stared into silence waiting for the first few dregs of java hued droplets to drip … and then it happened. Pop went the ‘crunch’. It’s kind of hard to explain, but my left leg sort of felt like it had attempted to migrate to a no-loitering zone. There was a mild pain, nothing to shout about, but something was definitely off. The coffee began to percolate and off I hobbled to a nook in the wall to brace myself for … well, dislocation I had imagined. So for the last week or so, I’ve felt like an old dog with rickety hips. You know, the ones they usually hook up to wheels before they put them down. It’s funny because just a month ago I was asking one of the gym trainers about increasing the intensity of my gym routine. Specifically, I had asked about running on the treadmill, instead of walking, or fast walking, as I do. What I was concerned about was whether there was a certain speed at which it becomes unsafe to no longer walk briskly, because your gait resembles more than that of a three-legged frog in a hurry – sort of as if your appendages are about to go flying off in different directions. Anyway, I thought it might be time to run with the rest of the gym pack, huffing, puffing, and sweating like world class sprinters. However, the trainer suggested I not run until I lost more weight. She mentioned something about heart attacks, dropping dead and corpses shooting off treadmills hitting other members. Yes, I concurred, we wouldn’t want to risk injuring the other gym members. So instead of running, I was instructed to increase the incline of the treadmill to provide for a greater workout. I guess I should be happy; things are looking up, at least by five percent. Yes, it did begin to bother me that after 3 months of going to the gym, I still get winded running for a bus or walking uphill. Ok, maybe ‘winded’ is not the best description. 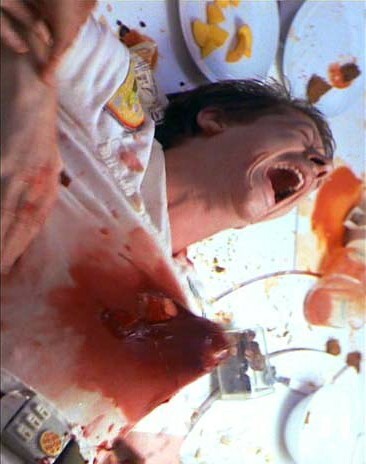 I feel more like like my heart is going to jump out of my chest, sort of like that ‘chestburster’ creature in the Alien movie. Get the picture? I think you do. Now to be honest, running was never my strong suit. Growing up, I never really liked playing basketball because of all the nonstop running and jumping ad nauseum. Playing football was much more to my liking; it was stop and go. You might run all out for one play, then you stop, re-huddle, discuss things for a while, and then catch your breath. Playing baseball was even better, especially if you played the outfield, which I did. There was plenty of time out there to relax, mull over your existence, decide what to eat for dinner and even attain nirvana, if you were so inclined. Yes, I guess I was not born to run. In fact, I think my ability to do sit-ups is suspect, as well. Let’s be honest here, it’s commonly understood that as we age, we all slow down. Joints go pop, tendons turn brittle, muscles knot, arthritis sets in, skin sags, and bones rattle and crack. Gravity mocks us as it pulls us closer to the ground as if to suggest that perhaps we were born to slack… or at least, return to the earth and dust from whence we sprang. Not one of my best days. So my mysterious hip ailment has curtailed my morning gym regimen to some extent. I suspect it may be lower back related, so I’m doing some stretches an orthopedic gave me when I turned 30, the dawning of lower back pain in humans. I’m still plodding along at the gym, albeit at a slower pace and with less frequency than before. I determined not to give in to my body’s subversive self sabotage, and our biological propensity for senescence – a fancy word for aging. See? You’re never too old to learn something new … until dementia and senility set in. See? You’re never too old to learn something new … until dementia and senility set in. See? You’re never too old to learn something new … until dementia and senility set in. PS. Thanks for reading. Do you have a handle on where your mysterious aches and pains stem from, or do you just need a handle to rise to the occasion… or any occasion? How do you deal with aging? Are you determined to age gracefully, or … are you never too old to learn something new until dementia and senility set in … uh, what was I saying and why does my hip hurt? I sympathize with you … NOT!